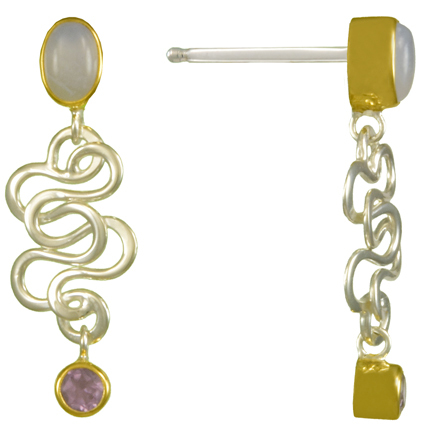 Michou Pink & Blue Chalcedony Ribbon Dance Earring in Sterling Silver and 22kt Gold Vermeil. 100% Hand crafted. Free Gift Wrap. This elegant earring from Michou’s Ribbon Dance Collection features pink topaz and blue chalcedony is handcrafted in sterling silver and 22kt gold vermeil and are 100% handmade. Free Gift Wrap. Forever Art to Wear, these earrings feature a pearlescent satin finish that is achieved by etching small criss-cross lines onto the surface of the silver or gold. This gives the earring a soft, rich feel. Michou’s satin finish was created to resemble mother of pearl. The silver is swirled by hand with a fine steel brush in order to create concentric patterns. 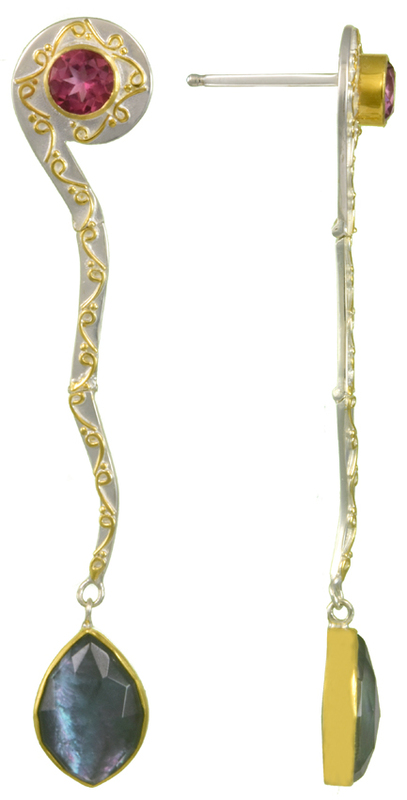 Gold vermeil is a process where microns of gold are deposited onto a sterling silver surface. The process is intricate in that all details that are not gold have to be painted on with a masking solution in order to protect the silver from the gold being deposited on it’s surface. 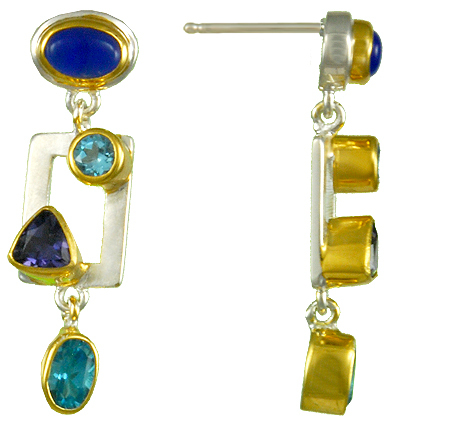 Vermeil is the official industry designation for heavy gold electroplating over a base of sterling silver material. A minimum thickness of 2 microns of gold must be deposited before it can be sold as vermeil. 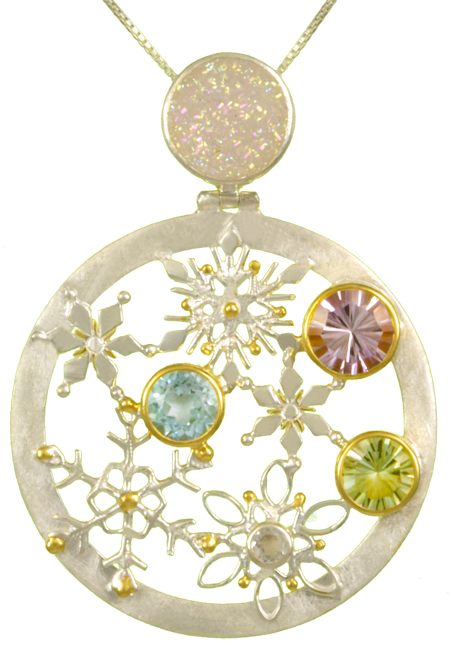 Michou’s vermeil is 22kt gold to a thickness of 3 microns. Surround yourself with the mesmerizing ribbon dance collection inspired by the graceful and hypnotic ripple of ribbons used by tumblers performing a combination of ballet, gymnastics and dance. Ingenious touches of twirling folding movement becomes a fresh and joyous expression of both modern and romantic sensibilities. Highly polished ribbons twirl amid the shimmer of rainbow moonstone layered quartz, blue chalcedony, and faceted raspberry and pink topaz and create a sophisticated yet playfully modern feel. Classic Michou scroll work and oxidized flat discs contrast each other while adorning swirling ribbons that set off the shimer of onyx layered quartz and raspberry quartz. Striking all metal pieces feature the interplay of gold and silver in romantic pieces. Ribbon dance is the perfect bridge between the Enchanted Garden, Iridescence, and Timeless Scrolls collections.